We all know them, they are called a vegetable, but botanically they are a fruit, well whatever they are called they still taste great. This baked savoury slice is very nice served with a tossed salad or eaten on its own as a snack. It's a nice addition to school lunches. 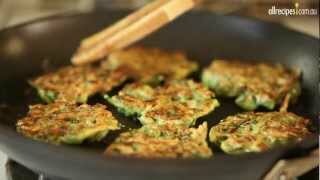 Yummy zucchini corn fritters - we can't get enough of them. These fritters are light and fluffy with lots of zucchini and fresh corn.